HUNTSVILLE – Huntsville High School band members will remember their Caribbean musical journey long after they clean out their lockers this summer.Grade 11 students Jazzmine Van Veld and Emily Edwards, members of the school’s band executive, travelled with about 50 other students and six chaperons to Cuba this past semester for a seven-day cultural exchange in Cienfuegos, Cuba. “Music is what my life revolves around, so for me it was the most important trip that would offer the most experiences,” said Van Veld. “And I wanted to experience music in a different culture,” said Edwards. 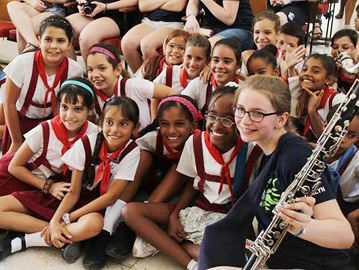 The students were immersed in Caribbean music culture through performances, salsa clubs and a visit to a performing arts school. Edwards said the students were able to experience the Afro-Cuban rhythms that are so common in Cuba, but rarely experienced in Canada. “They have different rhythms than we do. They’re a lot more complicated, but it’s just the norm for them,” she said. The pair recounted tales of musicians performing in the streets, learning salsa steps from locals and performing their own music for Cubans. The concert band, for example, was able to perform at a church on Easter Sunday for parishioners. But Edwards said what she noticed most was how content the Cubans were, despite having so little. Van Veld said the trip made her appreciate her high school’s music program, especially the instruments and resources available to students. The Huntsville students donated several instruments while visiting. But while Edwards agreed Huntsville students were fortunate, she said their Caribbean counterparts experience some benefits as well.